Investors are always looking to the future. With the forecast feature on the Cash Flow page they can bring that picture into clearer focus. First, users choose a period by selecting start and end dates. Next, users can adjust the settings on their cash flow projections to more accurately reflect the principal and interest rate percentages from overdue and defaulted loans. 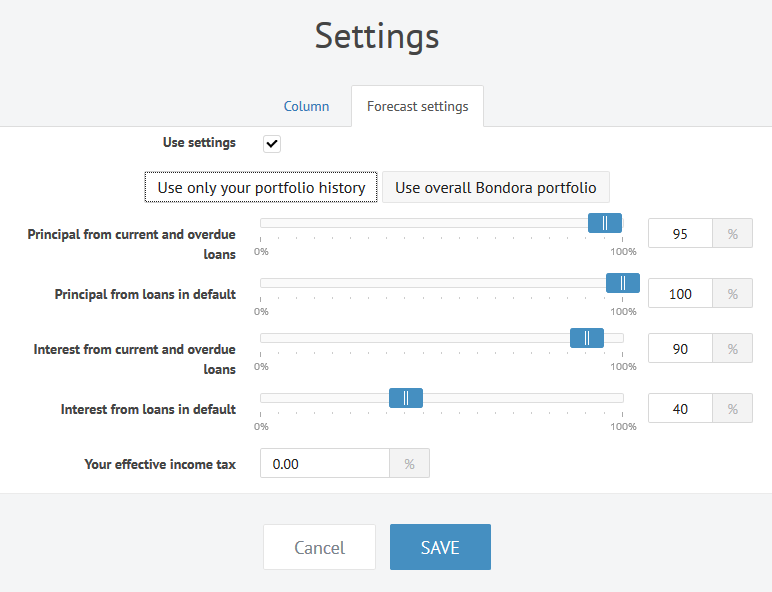 First time investors with a limited history will likely want to select the “Use overall Bondora portfolio” option. This is a preset, which represents the aggregate performance of default and overdue loans within the total Bondora framework. More seasoned investors with a longer history can select “Use only your portfolio history” to get a closer read on how the nuances of their holdings will impact future cash flows. The resulting numbers can be exported to a PDF or a CSV file for further sorting. The cash flow feature is just another example of the analytic tools Bondora provides to equip users with more information to make better decisions.